A bombing and city-wide lockdown in Boston, a chemical explosion in West, Texas; threats of flooding along the Mississippi River; the beginning of hurricane season; earthquakes; and the everyday house fire. These are a few of the disasters we all need to prepare for. We need to prepare at home with our families, at work, at our places of worship, and at the nonprofits where we spend our time. Most emergencies come with little warning. Many are unthinkable. Some are a once in a life-time experience. Others – such as fires – occur every day. How will you get ready? Think back on recent disasters such as Hurricane Katrina, the tornadoes that devastated Joplin Missouri in 2011, and more recently Hurricane Sandy. What will you do during the first 72 hours of a disaster when the likelihood of “help” arriving is low? Will you have food and water? Do you know how to let others know you are okay? Do you have a first aid kit? As a community, how will we check on elderly and disabled people living in nursing homes, or home alone? What about the small children in pre-school programs? What will happen to people with chronic diseases who run out of medicine? The Federal Emergency Management Agency (FEMA), and your local Office of Emergency Management deal with these issues on the macro level. It’s up to each of us to personally prepare. You can learn specifics about how to create your family communication plan and emergency kit at www.readyshelby.org. The Red Cross teaches “compression-only CPR” which is a way to save a life using only your two hands. 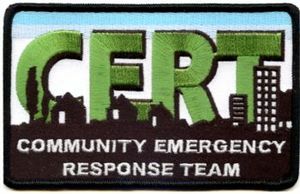 The local Office of Emergency Management coordinates CERT training. The program includes training in basic disaster response skills, such as fire safety, light search and rescue, team organization, and disaster medical operations. People with CERT training can play a critical role during emergencies when professional responders are not available. “It won’t happen to me” is a common response. But it doesn’t have to be yours. Get Ready! Next week: continuity plans for nonprofits. This entry was posted in FUNdraising Good Times and tagged Boston marathon, CERT, Disaster preparedness, Federal Emergency Management Agency, Hurricane Katrina, Hurricane Sandy, natural disasters, natural disasters preparedness, Ready Shelby, Red Cross. Bookmark the permalink.